OK, OK, let the “I-told-you-so’s” begin. The volcano got us. We left Seattle with assurances if we left 2 hours early, the airport would still be open – NOT! In fact, it seemed a bit suspicious that over half way thru the flight (beyond the turn back point) we got the bad news. 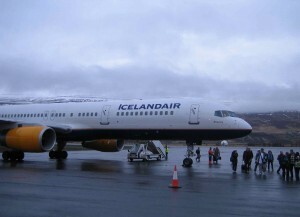 Well, I say news, I mean the speakers on that B757 were so crappy that between them and the lilting Icelandic patois, we had no idea where were going to land. The answer was a small town airport at the end of a fjord. Actually, inconvenience not included, landing at a remote airport has scenic advantages. You see, the town of Akureyri is on the north central part of Iceland and cleverly placed at the end of two mountain ranges. The landing approach was somewhat clouded in fog and mist and we broke out at what appeared to be around 500 feet, so we must have been on some kind of precision approach. Looking out the windows when we broke thru was interesting, to say the least. It was quite similar to the old Hong Kong city airport Kai-Tak. In this case, the mountains were a few thousand feet higher than the plane and the dogleg at the outer marker brought back memories. While on the subject of Icelandic Air, the less said the better. We are still trying to figure why they left Seattle? A word must be made about the airline food. Here it is: expensive & awful…that’s two words but they both fit the scenario. For example: For a measly $7 bucks, one could obtain a 3″ healthy wrap comprised of a tortilla, some limp lettuce, a bit of feta cheese, and carrot slivers. Bring your own food…the water is still free. 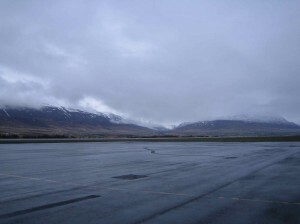 Upon landing in Akureyri at 4:20 a.m., we were greeted with 37-degree weather; the rain and snow were a nice touch, too. Let us note, the Icelanders are fairly nice people but I expect the leaving to be hell. We shot thru Immigration via two rather disinterested public servants to a customs inspector who wished us a pleasant 5 hour bus ride! On to Reykjavik. Interestingly, with excellent access to salt and fresh water, we expected a marina and/or a boat or two. None were to be found except for one commercial boat in one small northern town. No people, no boats, few tractors and a bunch of boxy houses set in an idyllic setting adds up to dichotomy. Perhaps May is not the yardstick. January, now that is the true measurement of the place and thankfully, we missed it. We did not miss two snowy passes but the roads were clear and thanks to my IPOD, trucking (Ok, bussing) was generally enjoyable. We should note that we have no idea how much the half way, road stop cost us for snacks. We could find out, but 1300 kazoozies seemed like a lot for 2 cokes, 2 waters and a coffee. 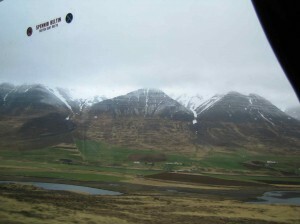 There is apparently plenty to do in Iceland and it is quite reminiscent of New Zealand. Although, the latest economic situation has made pretty much everyone eyeing your wallet, we had no trouble there, they just wanted your money and did not understand service was to be traded for it. Hell, I would have accepted a smile but they seem to be in small supply there. As Iceland is the land of volcano’s they were strangely absent from our drive while the air seems to leave a bit of grit in your nose and eyes but clouds are not evident. For almost a month now, I have been trying to pronounce the name of that troublemaker and it was a very nice Finnish lady who explained it in a straightforward manner. Rather than try to put the process together, we found that three words and a lilting emphasis on the “L’s” make a plausible pronunciation: AYA-FIOLA-YOKUL. Try it and amaze your friends. We even fooled a couple of natives. It is getting hard to read so I’ll sign off for now…TJW. PS. Upon leaving Iceland, we encountered the most incredible MESS in an airport I have ever seen in all my years of flying. 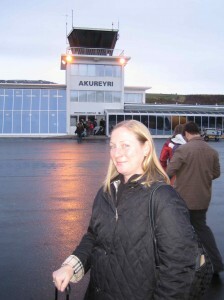 The small Keflavik airport coupled with an inept Icelandic Airlines staff resulted in the biggest cluster-scrum ever! Imagine – thousands of people in a tiny airport with one feeder line for passengers, cops that avoided the melee, an airline staff that was surly, pushing shoving fights, HORRID security, expensive food and drinks, late flights to accommodate all who were in line….and you have a small picture of the problems there. Missed one day travel, landed in CPH and it was pouring rain at 4:00 PM. Gosh, we love to travel!